Chrome, Satin Nickel, Brass or Oil Rubbed Bronze What is your favorite finish? Yesterday, I was having this very in depth conversation with one of my favorite people, Sherry of Sherry Hart Designs. (Side note: If you haven’t read her hilarious blog, Design Indulgence, you are truly missing out.) What was our in depth conversation about you ask? Politics? World Peace? No, fixture finishes. Yes, it may seem a bit trivial, but we were really into it. Does oil rubbed bronze have staying power? Will the “new” brass look really take off? Will anything ever beat polished chrome? It made me wonder what you all thought. What is your favorite finish? Are you brave enough to use different finishes? Let’s take a look at some of the popular and not so popular finishes of the past and present. …And this is now. With an antiqued look and much less sheen, this is the brass of today. Simply beautiful in a classic silhouette. 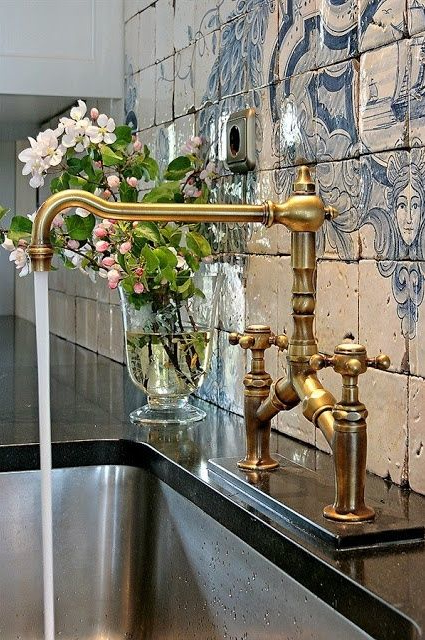 Antique brass is not a new finish, however, it’s been used for many years in some of the most beautiful of homes. When I visited the Biltmore estate last year, I remember being fixated on the brass fixtures in the bathrooms. 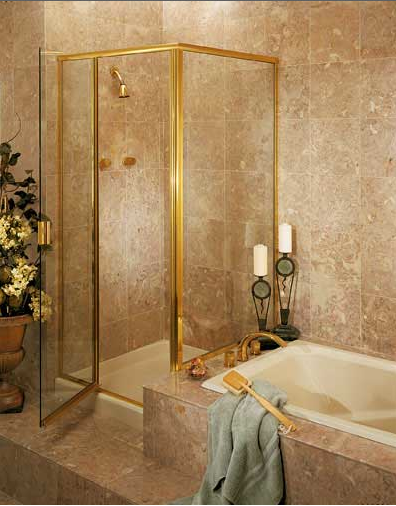 The drawback with this updated brass is that it can be more expensive. This is is also a finish that we designers and you very savvy blog readers love, but I am still waiting to see what my clients will say. Right now, most of them still look at me with horror when I even mention brass! Polished chrome or polished nickel are two of the most popular finishes. They look similar, but put them side by side and you will see that polished nickel is a bit warmer than chrome. They both can be used more easily to match existing hardware and are found in many different price points. To battle the watermarks and finger prints, satin nickel was introduced and has been gaining in popularity since the 1990’s. It is a very durable surface and can be found in many different price points and silhouettes, just like the polished chrome and nickel finishes. Many of my clients, especially those with children love this finish. It gives their homes a clean look without the maintenance of the polished options. Last, but certainly not least, is oil rubbed bronze. Now, I’ll be the first to admit that this finish has always been my least favorite. But, I will have to say that I while researching this post, I came across several images that I really liked. I may have changed my opinion. Again, like satin nickel this is a very durable finish and is available in many different price points. Oil rubbed bronze gives a space a very distinctive look. 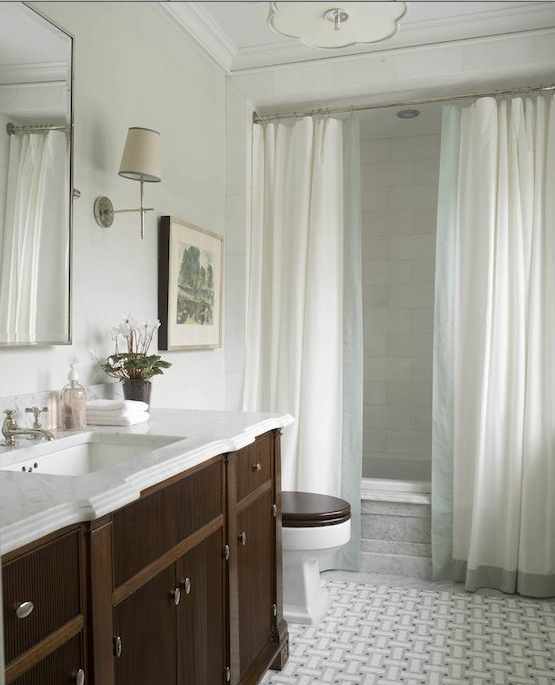 In the image above, for example, it creates a graphic look in this bathroom. It’s very striking, a nice mix of old world and modern. So, what’s a homeowner to do with all of these great choices? How about mixing them? What do you think? Would you do it? 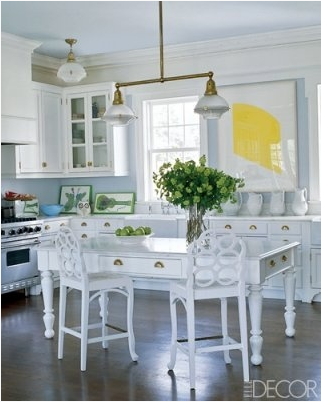 This image is tiny I know, but I love this kitchen. It is the perfect mix of modern and traditional style. That “clean traditional” look that I personally love so much. 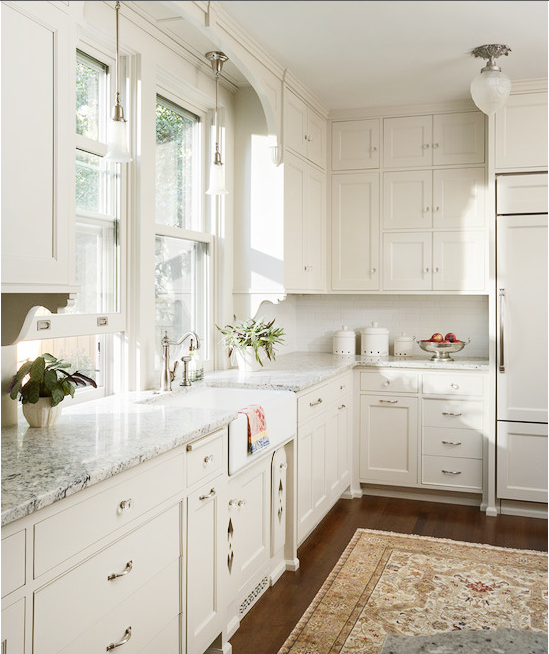 If you look very closely, you’ll see that this kitchen has antique brass lighting and hardware as well as chrome faucets. Again, a great mix of traditional and modern. This may be one of my favorite bathrooms to date. There are so many things I love about this space. The door and window, the beautiful counters, the slope of the backsplash. But, take a close look at the fixtures and you will see oil rubbed bronze, polished nickel and satin nickel. And guess what, it works, really well. I would also point out that if this space had been designed with only one finish, it would not be nearly as beautiful. This is a simple space that has been layered with many finishes and they all work together beautifully. So, what do you think? Favorite finish? Mixing? I’m looking forward to hearing your thoughts. 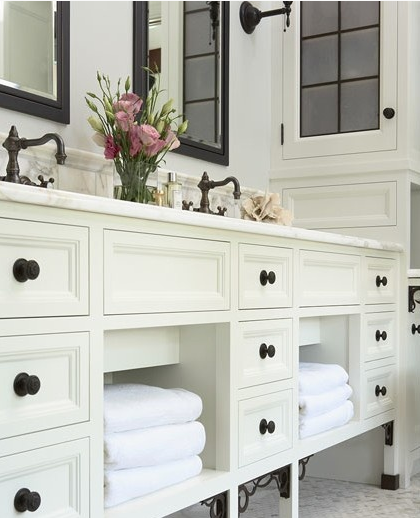 If you need help creating your own “clean traditional” look in your home, please contact me at Lori@LoriMayInteriors.com. I've been featured! Thank you Black Dress Red Wagon! What a thrill! I am so honored to be featured again in this fabulous magazine. For those of you who remember, my sweet girls and I were featured on the cover of Black Dress Red Wagon last year. If you live in Cobb County, you should definitely subscribe (it’s free!) and if you don’t, they have just as much if not more wonderful content online. 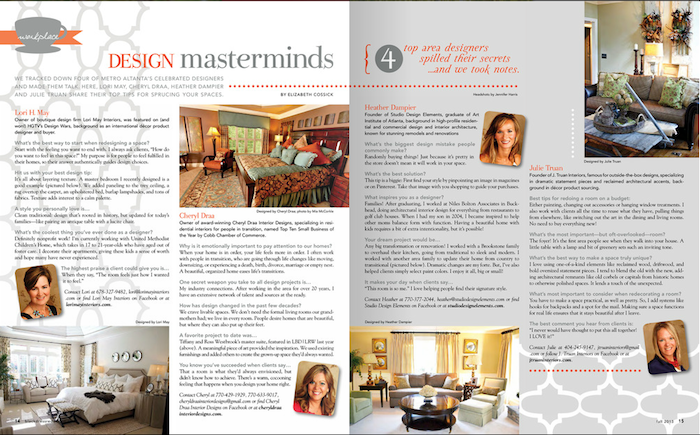 In this issue, I, along with 3 other amazing designers, share our top design tips. Head over to BlackDressRedWagon.com to read the article. Just a quick note about me, as many of you know, I took the summer off from the blog to spend time with my girls and take some time to reevaluate my design business. What did I learn? I think my biggest takeaway has been that taking a step back from the blog, though frightening at first, was the best thing I could have done. It has given me an amazing amount of clarity. I have gone from being completely reactive and drained of energy to feeling in control again. Now, I can’t wait to sit down at my desk and tackle my to do list! I’ll explain more later, but just know that there are some great things happening and I can’t wait to share them with you!